Did you know that THE TOUR stakes claim to being one of the tallest passenger vehicles permitted for operation by federal law? Fully accommodated with stadium-style seating that transports 49 spectacular spectators sideways, (say that 7 times fast) gazing through massive windows and ceilings unveiling New York City as a constantly evolving $50 trillion scenic background to THE TOUR powered by THE RIDE- it's the only way to see NYC. Thank you to THE TOUR for sponsoring this post with promotional media credentials for the purpose of facilitating this advertorial. 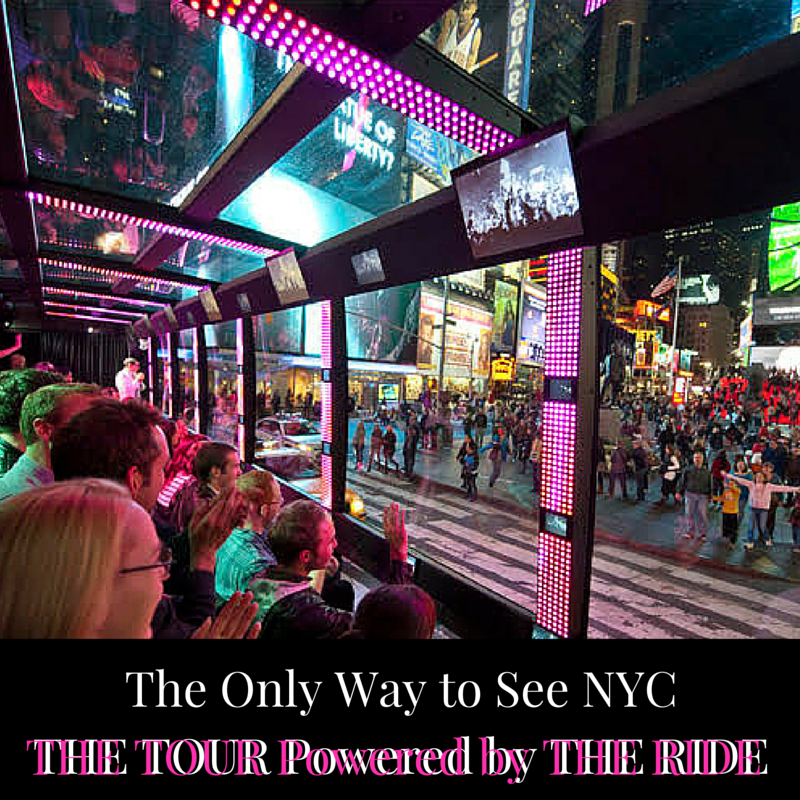 Unprecedentedly launched in 2015 by the producers of my personal favorite NYC tour-THE RIDE, THE TOUR delivers a first class tour of NYC in climate-controlled comfort, hosted by an informed and personable Licensed Gold Star Tour Navigator sharing everything New York and then some, utilizing the bus’s unique audio/visual patented technology. Learn historic facts from the past, present and future of NYC through the immersive, unique, multimedia sightseeing adventure of THE TOUR.Inside the coach, you’ll find 40 in-vehicle plasma monitors, surround sound, floor-shaker technology, THE TOUR offers the city’s only vehicle simulation experience! This is the Only Way to See NYC. The New Generation of Sightseeing! THE TOUR Powered by THE RIDE departs three times daily – seven days a week. Visit THE TOUR for Tickets Today! I was compensated with promotional tickets to THE TOUR for the purpose of facilitating this advertorial. As the owner of this blog, niecyisms and nestlings, I am compensated to provide my opinion on products, services, websites and various other topics. This blog may contain affiliate links. Even though, as the writer/owner of this blog receiving compensation for posts or advertisements, I will always give my honest opinions, findings, beliefs or experiences on those topics or products. This blog abides by word of mouth marketing standards. I believe in the honesty of relationship, opinion, and identity. The views and opinions expressed on this blog are purely my own. Any product claim, statistic, quote or other representation about a product or service should be verified with the manufacturer, provider or party in question.